There's a reason Jamie Fraser is known among Outlander fans as the perfect boyfriend/husband, impossible for any man to live up to - and that reason is abundantly clear in episode 206. When we last saw them, Claire had betrayed Jamie’s trust and forced him to agree to something that went against every fibre of his being. Now - only a day later - he’s rubbing her feet to the point of ecstasy, if the look on Claire’s face is any indication. Of course, it’s a little more complicated than that. Jamie’s obviously forgiven his wife - or at least reconciled himself to the reality of his promise; much to Murtagh’s disgust he’s called off the duel. But he’s also been thinking - and now demands a promise in return. Jamie made it clear he owed Frank nothing, and said he didn't give her Randall's life in payment of a debt [although I still think he believed it in the heat of the moment]. However, I was under the impression he hadn't agreed to it simply because he loved her, yet it turns out that was precisely the reason. Jamie wanted Claire to have someone - Frank - to go back to, should anything happen to him. Jamie got teary-eyed, I got teary-eyed, and Claire agreed. So he’s Mr Perfect. Again. However, he’s still just a man...and the road to Culloden is paved with good intentions. This is also when it starts to dawn on the audience that since Claire ended up back with Frank in episode 201...something awful must happen to Jamie. After an amusing scene where Claire chides Fergus, Murtagh grumbles and Jamie plays guinea pig for the fake smallpox concoction (to disrupt the wine shipment Prince Nincompoop will use to finance his war on the English), Jamie and Claire decide it’s time they tell Murtagh the truth. The Whole Truth. At first I was disappointed we didn’t hear Jamie tell Murtagh, it was a scene I’d been looking forward to. 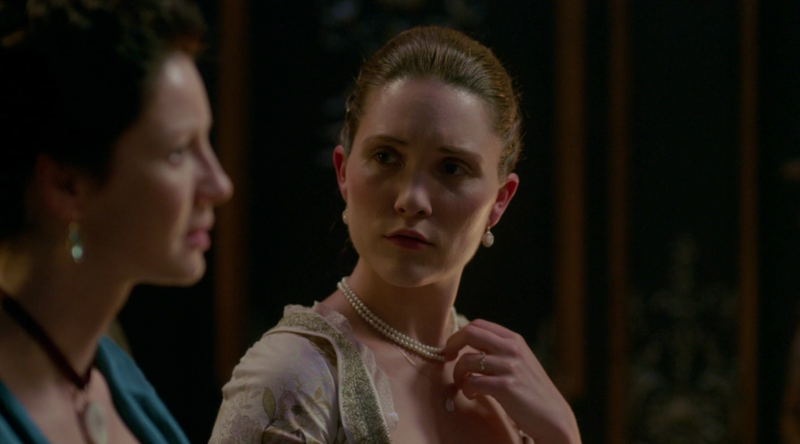 However, Jamie told Murtagh in Gaelic - which is never subtitled in Outlander - and it made perfect sense: they would speak their mother tongue if it was just the two of them in such a serious conversation. Besides, it reduced the chance of being overheard. I did think Jamie should have protested a little when Murtagh called Claire a witch, but he probably felt it better left alone. As it was, he still got a good thump from his godfather. What we did get to witness was the follow-up between Murtagh and Claire. Knowing Claire well after the months they spent together looking for Jamie in season one, Murtagh was probably more open to believing Claire’s story. He’s vowed to always stand by & protect Jamie, and he knows that she will too (even if he does often think she's bonkers). I liked seeing him processing the years and acknowledging the burden Claire holds. Unfortunately, the fake smallpox plan fizzles out - the Comte has circumvented the authorities - so the Prince demands that Jamie transport and sell the wine immediately. The Comte is extremely agitated, accusing Jamie of anything and everything. I love how Jamie only speaks English, and the Comte only speaks French during all their encounters - it enhances the conflict between them. So the Fraser gang are now onto Plan C (or D, or E…). Murtagh and hired thugs will pose as highway robbers, ‘stealing’ the wine shipment on the route from Le Havre to Paris. Before Jamie leaves, the prospective parents have a sweet ‘talking to the baby’ scene, then he’s off to execute the Plan. It works! The Comte nearly ruins it and Murtagh has to knock out Jamie to make it look believable, but it works! The Prince is despondent. Whining about his prospects for a future, he says that the last few months of sacrifice “have amounted to naught”. Apparently his depression leads to gambling, as Jamie is called back to the brothel to smooth things over...and while there, something (wearing a redcoat?) happens. Fergus earlier said to Jamie “out of sight, out of mind” - now it appears that may have been prophetic. Claire’s already had a bad 24hrs, so coming home to a note from Jamie - and the servants admitting he’s gone to duel BJR - is a bitter pill. For Claire, it’s black and white: Jamie promised. She says she understands, she wants to understand, she truly believes that she DOES understand what he went through. But, she’s not the one with BJR in her head every day and night. Claire’s worst fears are realised when she sees Jamie and Randall in the midst of a swordfight. Her labour pains intensify, and she’s bleeding - badly. As she collapses, Jamie fells Randall with a bloody blow to the groin. (Now, whether BJR lives or dies is irrelevant; even if he lives, his ability to father a child - to ensure Frank’s existence - is in doubt.) The gendarmes arrive to arrest everyone, Jamie screams for Claire - and we’re left with one hell of a cliffhanger, worthy of any season’s end. Good thing we only have to wait a week! I highly recommend this show to anyone who loves historic, cinematic pieces and movies set in specific periods with great stories of romance, action, and intrigue.